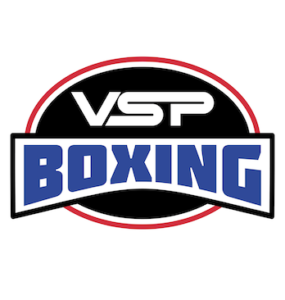 Epicentre.tv and VSP Boxing presents Victory 8 Saigon Fight Night. Vietnam plays host to some of Australia and Vietnam’s best young prospects live at the Nguyen Du Stadium Ho Chi Minh City. Banned for a number of years after the end of the Vietnam War, and only made legal in recent times, interest in boxing is on a rapid trajectory in this part of Asia. 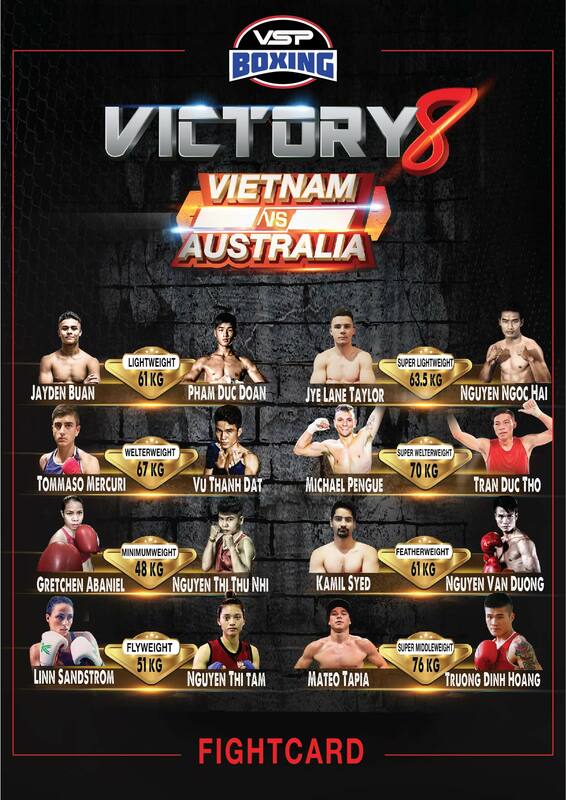 VICTORY 8 is a night where 8 top Australian fighters touch gloves with some of the best in Vietnam. The Aussie team contains Professional and Amateur national champions – including future world prospect Mateo Tapia and 3x female world champ Gretchen Abaniel. The Vietnam squad boasts recent Asian Games medallist Nguyen Thi Tam and also SEA Games Gold medal winner Truong Dinh Huong. Talented lightweight Nguyen Van Duong has already tasted International success and looks a star on the rise for Vietnam boxing. The show on November 3rd will take place at the Nguyen Du Stadium in HCMC. The 8 fight card is a cracker including two female bouts. Matches will be of various weight classes ranging from minimum weight through to super middleweight, All fights will be contested over four rounds. These two young fighters match up excellently. In spite of being skilful boxers able to box off the back foot Jayden Buan’s fast hands and youthful exuberance will clash with Pham Duc Doans southpaw power. While Pham Duc Doan confuses fighters with deft head movement and southpaw footwork, he is aggressive and prone to trading, which the Australian Jayden Buan willingly looks to meet and dominate. 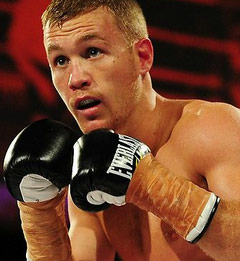 Jye Lane the quick silver boxer is one of the younger fighters of the Australian stable and believes himself to be unstoppable. He will face the tough and durable Nguyen Van Hai. Taylor comes into the fight as a heavily touted amateur champion who turns pro soon but will have his hands full with Van Hai’s battle tested, resourceful style and extensive boxing and kick boxing experience. Nguyen Van Hai is an exciting counter puncher with a good chin, so is an excellent tune up for Jye Lane Taylor’s imminent professional debut. Tommy Mercuri and Vu Thanh Dat will meet in centre of the ring and battle for the win with neither fighter expected to concede ground. Tommy, trained by his father, is an accurate puncher with a killer instinct and Thanh Dat is a quality counter puncher with heavy left hooks to the head and body. Both fighters have big right hands – Tommy’s carries more power – Thanh Dat brings a greater volume. Tran Duc Tho’s svelte movement and iron will is facing Mickey Pengues intelligent pressure and brutal selection of punches. 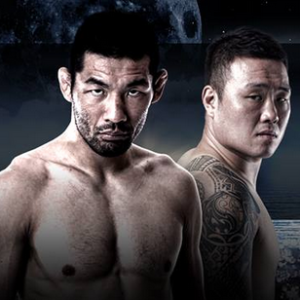 A huge test for both fighters at the 70 kg limit. Tran Duc is not averse to a punch up but will be pushed to the brink by Pengue’s fire power. Celebrated filipina world champion and vicious combination puncher Gretchen Abaniel takes on Nguyen Thi Thu Nhi. Both fighters bring high punch volume and experience. Gretchen has fought and bested some of the best female boxers and looks forward to the challenge a young, hungry Thu Nhi brings. Australian amateur bronze medalist Kamil Syed brings a rangy and calculated boxing style to the squared circle against Nguyen Van Duong. Nguyen brings crippling punches and relentless fighting spirit to this bout. 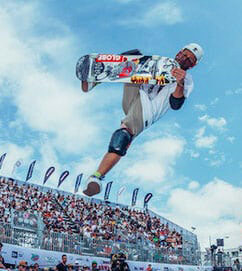 Van Duong looks to implement pressure and his superior fire power to test Kamils distance and timing. Two spectacular athletes put it all on the line. Nguyen Thi Tam, rising star of Asian boxing looks to show case her brilliant technichal boxing skills to defeat another international name while Linn Sandstrom, the former swedish table tennis champion, looks to upset Nguyen in hope of capturing the win and hearts of the Vietnamese public.